Fun times down on the farm tonight, literally!! Greenbrier Farms turned their Wednesday night Porch series into a ‪#‎GCBW‬ event, with 4 breweries pouring and two wood fired pizza ovens churning out delicious pies! There was food, wine (! ), beer, music, dancers and, oh, more beer. The Farm is a bit of a drive to get there, tho it is very scenic and comforting, in a country kind of way. This was my 4th GCBW event in a row, I'm trying to stay focused, here are some photos which hopefully capture some of the fun. I'm off for a nap! Cheers and on to the next event!!! I know it's only Tuesday, but the ‪#‎Greenvillecraftbeerweek‬ event at ‪#‎Upstatecraftbeer‬ has to rank as one of the top events that local beer brewers/lovers have enjoyed so far. This was the big collaboration night that was so highly anticipated. 13 breweries, active or about to be, were represented by their efforts in making this collaboration history. 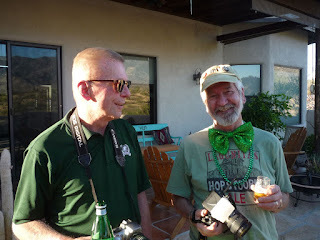 Looking around I saw practically all of the Greenville brewing heavy weights gathered on one spot for some true appreciation of what each was capable of, with the assistance of Chris Hardin, Upstate brewmaster, and Jack McDonald, co-owner. I'll get into the brews that caught my attention later (there were several) but for now, a few fotos that hopefully capture the spirit of the event. Btw, the muffin tins you see in abundance are a link to the history of the building that houses Upstate, the Clausen Bakery. Drop by the brewery and Chris or Jack will be happy to give you the details that fueled this inspired tribute. It's happening! 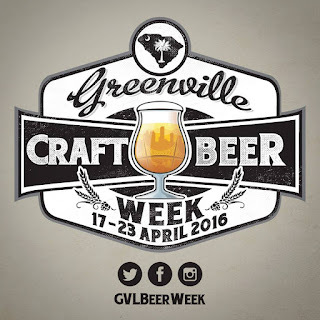 The Greenville Craft Beer Week is up and running (drinking?) on all fermenters. Sunday afternoon was the official start at Brewery85, with help from Upstate Craft Beer Co, where people sat at tables to recite embarrassing answers to fill in the blank questions, otherwise known as Cards Against Humanity. I guess the beer helps remove inhibitions, people seemed to be into it. Next stop was Bistro Passerelle where The Community Tap joined with Passerelle's chef Teryi Youngblood to provide a unique pairing of special beers with Teryi's creations. Limited seating sold out and the afternoon was perfect. I would have loved to stay but duty called (read: they offered me no free beer) so I headed for the next event. Which was the fund raising beer auction at Barleys Taproom. The pool tables upstairs served as displays for the donated brews with their silent auction bid sheets. Some hard to find and unusual beers were offered. A live auction energized the crowd at 8pm or so. Last word I received was that the live auction raised over $5000. for The Julie Valentine Center, which offers support for abused children. Good beer, a good time and a good cause. Another example of the benevolent activities of the craft beer community. More to come of course, it's only Monday, including a dinner/beer pairing at The Trappe Door tonight. I'll report on those later in the week. Great (and unbiased) news: the collaboration beer that I brewed with Jason Uhrinek, Citra Kollision, a session IPA with wicked amounts of Citra hops, is now on tap @Upstate Craft Beer Co. Come join me in this resiny wonder!!! Thanks again to Chris and Jack for making this possible. It came in at 60 IBUs and 5.0 ABV. Perfect Session IPA. Bottle conditioning the bombers this week, bring'em home next week. An Air Force Unit reunion leads to some beer discoveries. Read on. St Patrick's Day fell into our schedule, so we participated. We flew in C-130s similar to this one. While in Tucson for an Air Force unit reunion, had no choice but to check out the craft brewing scene. And there was indeed a lot to check out.Tucson has a very thriving beer community with more on the way. I volunteered to host a pub crawl so was forced to make some decisions about which ones to visit. Location was important since these old guys I was with couldn't walk too far. Fortunately one was on the way to downtown and the other two were a block apart. I also had one backup in case we needed another but time ran out, as often happens with these events. First stop, Sentinel Peak Brewery. Sentinel is a 3 BBL nanobrewery, which opened its doors in January, 2014. I suggested we start with tasting samplers so that folks could discover which styles they liked, while at the same time keeping the alcohol intake low. Several of the group had never seen a tasting flight, so the education level was high on this tour right from the start. The samplers included the Icebreak IPA, Alc/Vol: 6.3% IBU: 82; the 1811 Desert Blonde, Alc/Vol: 5.2% IBU: 29; the Heat Wave Hefeweizen, Alc/Vol: 5.1% IBU: 14; and the Dew Point Dunkel, Alc/Vol: 6.1% IBU: 27. I added their Overhaul Spicy Chili, being a fan of chili beers, but this one was too hot to enjoy! One bit of coincidence, totally out of the blue: our group is formed of Chinese linguists, (known as Bats cause we were air crews in special C-130s flying missionsout of Yokota, Japan and Da Nang, Viet Nam, hidden away in dark cubicles) and the co-owner of Sentinel, Jeremy Hilderbrand was an Army Russian linguist. Just confirms what I've said many time, the brewing community is a small world. Where the beer magic takes place for Sentinel. Thanks to Rachel De Cesari for her help in getting our group supplied with beer. My eager-to-learn fellow pub crawl partners. Next crawl destination was Pueblo Vida Brewing Co., located downtown, not far from the infamous Congress Hotel. While there I was fortunate to meet Owners Kyle Jefferson and Linette Antillion (Kyle's the Brewmaster), busy hosting the quarterly AZ Brewer's Guild meeting. Most of AZ's craft beer owners/brewmasters were in that one room! The noise level and beer drinking activity was appropriate for the occasion. Staff member Billy Krukowski gave the group an introduction to PV, describing their beers and their facility made of mostly re-claimed materials, some of the wood being from the original structure. First of several tasting flights, we sampled 8 of the 10 offerings. Their Northwest IPA was a favorite as was the Li'l Red Ryeding Hood session rye IPA. All well made beers and worth trying again. The Northwest name is in reference to the brewing Kyle did at Lazy Boys Brewery in Washington state, where, coincidentally, he co-brewed with Tim (last name to come) who later came to Asheville to start Burial Brewing, the new Sour headquarters. The group was very eager to learn about the different beer styles and to expand their tasting experience. I always appreciate a group that is genuinely interested in learning about beer and the brewing process. Our last stop for tasting and for dinner was the Thunder Canyon Brewery, one block away. Turns out, this was their brewpub but actual brewing took place at another facility north of town and too far to include on our travels. None the less, all their beers were available so we continued out practice of getting tasting flights, letting people choose their favorites and ordering pints accordingly. This was a full range of styles, choosing the first 6 to sample was a bit of a challenge. I went with their cask conditioned Good Vibrations IPA w/El Dorado hops for the hop fans, chose their Deep Canyon Amber for the hop-shy and added their Aged Bing Bang Ale, an aged American Strong with cherries and raisins, to demonstrate just what extremes some breweries are achieving in their efforts to find new flavor profiles. By now, everyone was comfortable with the format so before long, most had a pint in front of them while thoughts turned to dinner! I consider that a success and my work done. Now, let's chow down!